This may be the most important post yet in our discipleship discussion. I am going to lay out a progression that Jesus purposefully left for us by his example. He was the master discipler and I believe that the best way to learn to be a disciple and learn to make disciples is to follow Jesus’ lead. When you enter the school of Christ (T. Austin Sparks’ phrase) you enter by answering the call to come and follow Jesus. I remember getting the letter and phone call that I had been accepted to a doctoral program. I had been on the alternate list. I was on the bubble. Did they want me or didn’t they? Apparently enough people choose other schools that I got in! Jesus doesn’t work that way. Jesus loves everyone and calls everyone. It is up to us to accept the call. It goes like this – Jesus already accepts all of us as potential disciples (followers) but we will accept his acceptance? It feels good, no, great to be wanted…to be called…to be accepted. Jesus has accepted you into his discipleship school. It is up to you whether or not you show up for class. This call is found in Matthew 4:18-22. This is where you start. You start with the call in Matthew 4:18-22 and move to what happens next. This is us following Jesus’ lead. Immediately following the calling of his first disciples, Matthew tells us in Matthew 4:23-25 that Jesus was in the lead. He was teaching a particular teaching (about the gospel of the kingdom – we will talk about that relentlessly later) and Jesus was doing particular things (healing dis-eases and casting out demons). Jesus did this repeatedly. He went throughout Galilee in the synagogues doing and saying the same things over and over. Ever wonder why Jesus did and said this over and over? Because he was nice of course. Because he always had a new audience. Of course. But have you ever considered the discipling function of Jesus’ repetitive teaching? He wanted his followers to learn his yoke, his particular instruction. There are many instances in the Gospels where we are told Jesus preached this same message. This moves us one step closer to 300 level courses. Once you gain entrance into Jesus’ Discipleship University by him calling you and then you take and pass the 200 level courses of observing Jesus’ teaching and doings you move on to 300 level courses. We find these in Luke 9 and 10 where Jesus sends the 12 and the 72. You will notice in those passages that Jesus sent them to teach the same things he had taught in their presence. This is a repetition of the earlier Matthew passage but now the disciples are teaching and doing, not Jesus. 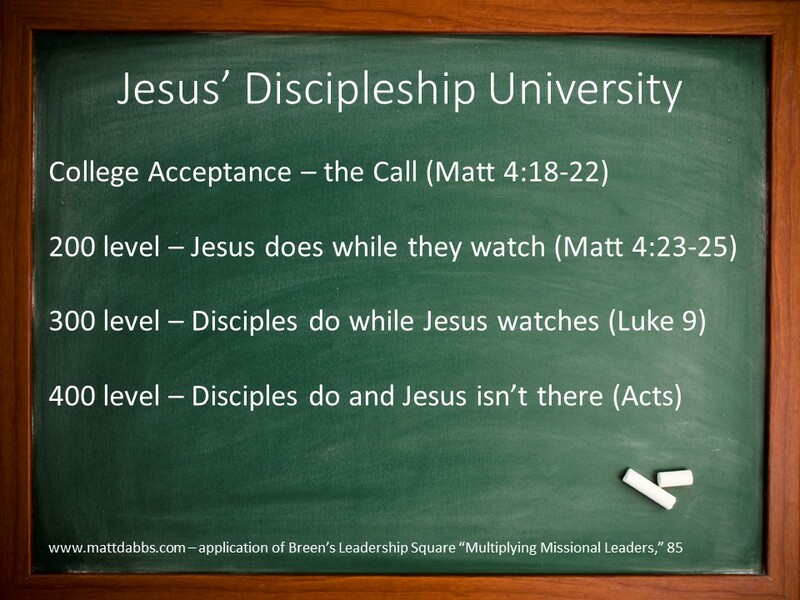 300 level discipleship – be sent to teach what Jesus taught and do what Jesus did in Jesus’ absence. Then they return to Jesus to debrief. He instructs them further. From this point on Jesus involves them in the mission more and more. He involves them in passing out bread and fish. He leaves them at the bottom of the transfiguration mount (9 of the 12) where they will try to cast out a demon and fail. He gives them instruction to prepare the last supper. These are important equipping moments because later he will sent them out into the world to be his witnesses in his absence. These are just a few instances that Jesus made an intentional shift from him doing and them watching to him watching and them doing. That brings us to discipleship 400 level. 400 level discipleship is the book of Acts. This is teaching what Jesus taught and doing what Jesus did in Jesus’ absence. We aren’t left alone. We have each other and we have the Holy Spirit to empower us but Jesus has left us to do these things without him. That was the goal of the whole process. All of us who are Christians are somewhere in this process. Maybe you have received the call and haven’t progressed. Maybe you have listened to his teachings for years but never got out of 200 level courses by being sent out to share these things with others to go onto the 300 and 400 level courses. Let me give credit to Mike Breen and his book Multiplying Missional Leaders p. 84-85 for the progression on the blackboard. I read his book several years ago and it certainly influenced some of my thinking and verbiage here. His work is excellent. It is important that we are all growing to maturity and I believe Jesus modeled for us exactly how to do this. This will be the structure of a lot of future posts. What do you think about this process? Do you think it is valid? What drawbacks might it have? 1. I do it, you observe. 2. I do it, you help. 3. You do it, I help. 4. You do it, I observe. I’ve seen that elsewhere, so it may not be original with him. But I see some similarities with what you shared. Thank you for this Tim. Now that I see it here I do remember reading that several years ago in Breen which undoubtedly influenced my thoughts here. I will give credit in the post.